First of all, let’s set the record straight, you do NOT have to be flexible to attend a Pilates class. In fact, if you’re tight and stiff then I recommend you sign up for a Pilates class right away. Sure, it may be challenging at first but our bodies were meant to move and the longer you wait to move your body the less mobile you will become. Flexibility is as much a part of “being fit” as being able to run without getting winded. A well-rounded fitness routine should include exercises that stretch your body and increase/maintain healthy range of motion. You don’t want to be all big, tight muscles with little flexibility. That’s not a comfortable body to live in and it’s a also body begging for injury. A fit body is a balanced body. Flexibility is just one of the many aspects of the Pilates method. Many of the exercises are designed to increase range of motion and lengthen muscles that have become tight and short over the years. So, if you’re one of those people who can hardly bend down to touch your toes you may want to consider joining a beginner Pilates class to do your body good. As a beginner you may find that some of the positions are hard to hold and maintain. I recommend using a modifications to make the exercises more comfortable while you gradually improve your flexibility. This simple seated position can be very hard to maintain if you have tight hips or hamstrings. Your goal should be to sit up straight without rounding forward. Tip: Fold the towel a few times and use it as a little seat. This will allow more room for you to move with ease. It may also be helpful to bend your knees. The roll up is a very challenging exercise and is made all the more challenging by tension in the low back. Tip: Fold the towel 1 or 2 times and place it under the small of your back. This will act as a tactile aide and relieve tension as you roll up and down. Bending your knees may also help. The pelvic curl is a fantastic exercise to increase the flexibility of the spine. You may find it hard to roll smoothly through each vertebrae if you have a stiff back. Tip: As you roll down from the pelvic curl position, allow your heels to lift slightly off of the ground. This will provide more room for your back to lengthen and stretch helping to relive tension throughout the exercise. Planks are a fantastic exercise to build full body strength but can put excess pressure on the wrists until adequate strength is developed. 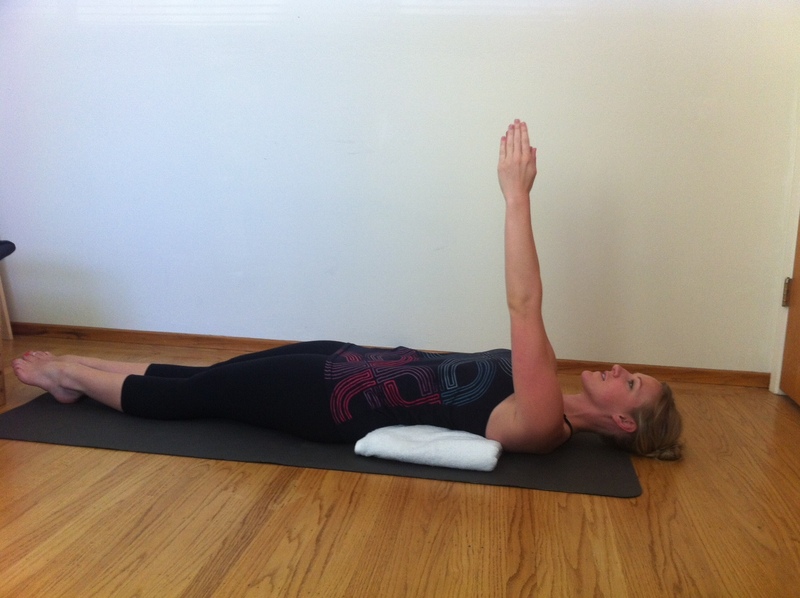 Tip: Fold your mat (or a towel) up under wrists to lessen the angle of pressure. In many exercises using your elbows can work as a modification as well. The side leg series is fantastic for shaping and strengthening the sides the body. Based on the angle of your hips you may find that it is uncomfortable to rest on your side. Tip: Place a towel under your hip as you lay on your side for extra padding. This should alleviate any discomfort. In addition, if you feel strain along the side of your neck fold a towel 2 times and place it between your arm and your head. This will bring your head back in alignment with your spine and relieve tension in the neck and jaw. Do you have other questions regarding exercises I didn’t mention here? I have a question for you. I struggle to do much of pilates because of my tight hamstrings. (At least I think that is what it is. 😉 ) It is especially difficult for me to do the exercises where you are on your back with your legs straight up in the air. Most of the time I just bend my knees but that makes it very difficult to do some of the exercises, especially when the legs are moving. Do you have any suggestions other than just bending my knees? Thanks! I have been enjoying doing your 28 days of pilates!! Thanks so much for doing it! Thanks Robin. Great tips. Sometimes what appears to be hamstring tightness can be nerve tension limiting range of motion. I know that’s my problem, after having a herniated disc in my low back years ago. My hamstring length is within normal limits, however, the nerve tension or limited nerve glide in the dural tube impacts my ability to do some of the exercises on my back with my legs extended up to the ceiling. Thank you so much for these tips! I just did a roll up with the assistance of the towel rolled up under my back. I am so happy. Do you have any tips for doing rolling like a ball, the teaser, and the hundred? Could my tight hips be making these hard to do also?